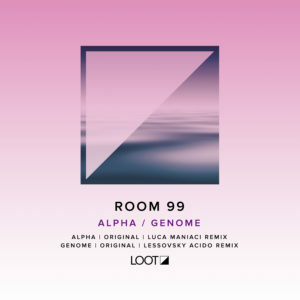 Based in Kiev, Room 99 makes his Loot Recordings debut with two tracks that include remixes by Luca Maniaci and Lessovsky. The title track ‘Alpha’ hits from the start with a heavy groove that’s fueled by a monstrous kick, rapid fire hats and heart-pounding bass line. It’s an endless 8 minutes of melodramatic melodies that’s infused with rising synth crescendos and abrupt breaks that makes the magic happen. Remixing ‘Alpha’ is Italy’s Luca Maniaci, one of techno’s rising names with tracks on Ovum Recordings and Solar Distance to name a few. An intense techno interpretation that perfectly incorporates the original’s melody, a bubbling synth and bass line dominate the track accompanied by a wild arrangement of hi-hats, claps and rides that puts it into overdrive. The next original is ‘Genome’, a hypnotic, analog affair that carries you away for seven plus minutes with a mesmerizing 303 acid melody. A less-is-more approach that packs the perfect amount of energy to keep things interesting and crowds locked into a techno-trance groove. Closing the release is the Lessovsky Acido Remix, who is best known for his deeper flavors and melancholic productions. His version delivers a lovely combination of dusky melodies, emotional, sweeping synths and lush overtones that make this one just right for all the euphoric moments.